This post is a 24 hour Istanbul itinerary with the ultimate travelguide about what to see in Istanbul in one day. 24 hours in Istanbul is way too short and I really regret I did not have more time to explore this vast multicultural city. I arrived late in the evening on a flight from Tehran and had a full day before flying back to Amsterdam. It was a crazy day, but because I prepared my Istanbul itinerary well I managed to see the most important sights. Below I like to share my one day Istanbul itinerary with you and share my tips on how to make the best out of one day in Istanbul. There are a lot of mosques in Istanbul and if you have to choose only one mosque in your Istanbul itinerary make it the blue mosque. I already visited the blue mosque in the evening when I arrived and the surroundings were peaceful and quiet. Even tough the mosque is closed at that time it is nice to walk in the courtyard without the crowds. The blue mosque was the first thing to see on my Istanbul itinerary the next day. Despite getting up early, it was already very busy. Once you are inside it is easy to understand why. What an exquisite beauty that can only leave you in awe. The next stop on my Istanbul itinerary was the Hagia Sophia. This was my biggest priority to see in Istanbul. A church built-in the Byzantine time turned into a mosque and now a museum. It has Istanbul’s history packed into an amazing architectural wonder. The palace where the sultans of the Ottoman empire resided for generations was another priority for me to visit and was next on my Istanbul itinerary. I did not expect to spent so much time at Topkapi, but the palace was much bigger than I thought. There are three nice courtyards with several beautiful buildings that all have different purposes. Before I knew I spent two hours walking around. The Topkapi palace was also very busy, but I tought it was definitely worth it. If you have the museum pass you should also visit the hammam. If not, you should pay an additional entrance fee for this area, which in my personal opinion is not really worth it. One advantage of having the Museum pass is that several museums are included that I would have otherwise skipped. The archeological museum was one of them. Because it was close to the Topkapi palace I decided to make a quick visit and I was positively surprised by their interesting collection. This is a must visit for history lovers. After all the museums and mosques I was hungry. I took the tram to the Galata bridge over the Bosphorus to try out the famous balik ekmek (a fish sandwich). Unfortunately I did not have time to enter the Galata tower and instead I ate my sandwich while watching the boats on the Bosphorus river and the fishermen on the bridge. How else could I end my Istanbul itinerary then with some last-minute shopping in the grand bazaar. After visiting the bazaars in Iran, such as Tehran bazaar, I missed the beautiful ceilings and left over details from the past. The bazaar in Istanbul lacks the authenticity you find in Iran. That said, it is still an excellent place to go shopping for spices, tea and delicious sweet turkish delight. Obviously the cats of Istanbul were not planned in my Istanbul itinerary. However, even if you are just one day in Istanbul you will meet lots of them. What I really liked is that the people in Istanbul take really good care of them. People pet them and even leave food for them. It’s always a joy to see happy cats wandering around a city. The beautiful movie Kedi about the cats of Istanbul is great to watch before visiting the city. The food is one of the main reasons I would like to go back to Istanbul. Turkish food is delicious and there are so many local dishes I had to miss out on, because I had no time. I only have one stomach and there is only so much you can eat and try in 24 hours. Honestly, finding good local food is not easy in Istanbul. Most restaurants cater for tourists and serve the same menu’s of kebab. I havent found a special hidden gem that day, but really enjoyed the balik ekmek (fish sandwich) on the street at the Galata bridge and the turkish delights I tried in the Grand bazaar. You always need a reason to come back to a city and for me the food will be one of them. I stayed in the Stanpoli Hostel in the dormitory. I tought it was a good hostel with an excellent breakfast buffet on the top floor with a wonderful view on the Bosphorus and the city. Istanbul is a big city and to keep it cheap you should consider buying these cards, even when visiting for a day. Istanbul card – This card allows you to travel on public transport and get a 40% discount on the fares. There is an extensive network of metro, tram and ferries. You can buy the card at the airport and then travel from the airport to Sultanahmet by metro, already saving you a lot of money. Sultanahmet is where most sites like the Hagia Sophia, Blue mosque and Topkapi palace are and a good place to stay with several hostels and guesthouses. It is easy to explore Sultahnamet on foot, but if you want to explore other parts of the city the card comes in very handy. Museum card – If you want to visit both the Hagia Sophia and the Topkapi palace it is worth to buy the Museum card. It is slightly cheaper and allows you to visit several other museums as well. One other advantage is that you only have to stand in line once to buy the card. This will save you a lot of time, because the lines at the Hagia Sophia and Topkapi palace are long. Seeing Istanbul in one day is a challenge. With so many things to do you will really need to focus on the highlights and even then it will be a fully packed day. The following tips will help you make the most out of your day. 3. Prepare your Istanbul itinerary: Decide what you really want to see when you are in Istanbul. 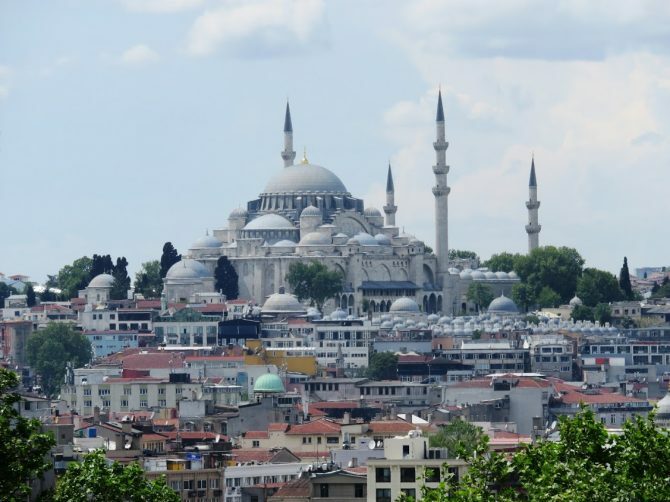 It is a huge city and my one day Istanbul itinerary not only includes the highlights, but also made sense logistically as the places were quite near each other. If you have only one day in Istanbul and you don’t want to spend your time stuck in traffic find out how you can travel between the places you want to visit beforehand. Public transport is cheap, but distances are big and traffic can be crazy. Is it safe in Istanbul? When I arrived late in the evening at my hostel I was greeted by several cats in the window. While I was paying attention to the cats the owner of the hostel came outside to greet me by my name. I was surprised he knew who I was, but it turned out I was the only guest that day. With recent terrorist attacks the tourist numbers have gone down and most tourist establishments are struggling with the decline of income. The chances of you accidentally being in the wrong place at the wrong time are still very small and therefore I can still recommend Istanbul to anyone. For me, I felt safe in Istanbul, even as a woman travelling alone. Istanbul is a big city and like in any other city you have to be on your guard for pickpockets and tourist scams. These scams are more likely to bring you into trouble than terrorism. Click here for an article on the most common tourism scams in Istanbul. I liked the section about safety. That was my main question. It seems like such a cool place to visit! Thanks for the information and inspiration! I was thinking of buying the Museum card but now I’m sure I’ll will do it. Luckily, I have a few more days to use it. Thanks Ellis. I was just in Istanbul for a layover and it was such a great city! I’m so sad I missed the palace but logistically could not make it there! Next time I will definitely make it there! Looks like you had a great day! Love the information about cats, that’s really cute and quite unique! The architecture looks incredible 🙂 thanks for sharing! Istanbul is such an amazing city! We spent a week there and were still discovering new places everyday. If you ever go back I can recommend visiting the Prince’s Islands by Ferry for a great a day trip. The food is so good too! I almost booked a flight considering something like this. Next time I’ll take it as I’d love to see the Blue mosque! I had no idea so much was possible.